By 1995, I was wholeheartedly invested in travelling down the jujitsu path. Whenever my work schedule allowed, I was taking Danzan Ryu jujitsu class Monday and Friday nights, Judo Tuesday and Thursday nights at the Kaimuki Judo Club, and Daito Ryu Aiki-jujitsu on Wednesday and Saturday. 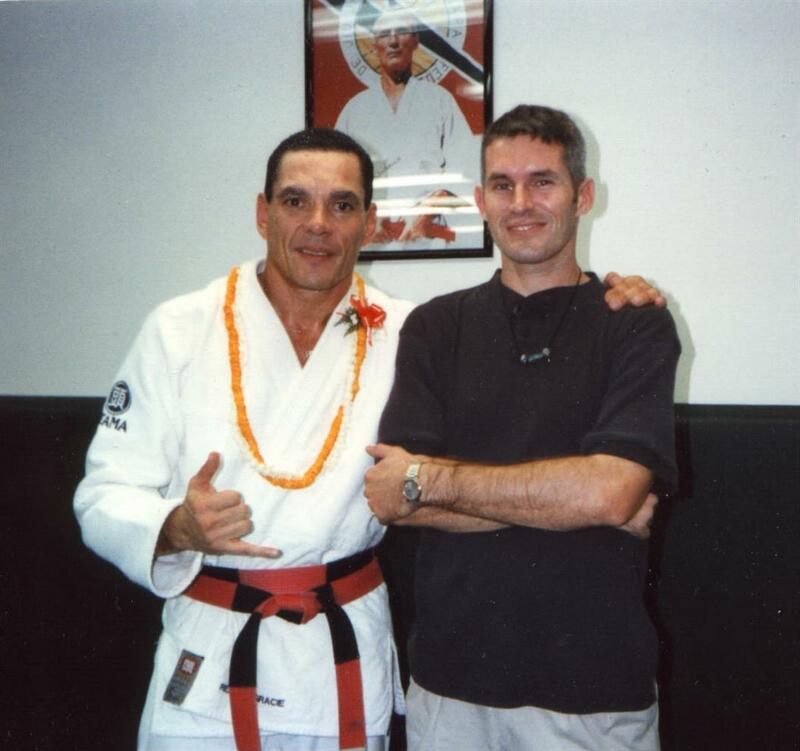 One day I was talking to my neighbor Joe and one of his friends who, upon hearing that I was interested in martial arts, said, “You know, there is a Gracie brother teaching jiu-jitsu here on Oahu.” No, I did not know that! After a few phone calls from a friend to a relative to who knows who, I found my self on a waiting list to take jiu-jitsu class with Relson Gracie. I hoped the wait wasn’t too long. Someone would have to quit coming to classes so the room would not be over legal capacity! Almost a month had passed when I finally got the phone call. My first class was at a gymnastics studio not far from Pearl Harbor. It turned out to be the satellite “gym” for the future famous Onzuka twins, Chris and Mike. I was admittedly a bit star struck when Relson walked in the door. I had seen him repeatedly on videotapes walking in with Royce at UFC 1-4. I really couldn’t believe that I was now taking classes with Helio’s second oldest son. At the end of that session, which I can only remember getting repeatedly scissor swept by a guy who had been in class for only a month, I was told about the classes being taught Monday and Friday nights at University of Hawaii at Manoa. That is a location well known to many who started Gracie Jiu-Jitsu in Hawaii in the 90’s. Walking down the hallway to studio 4 at the athletic complex during the evening was amazing in itself. I walked past a Hula class (yes, I stopped and watched sometimes,) a karate class, and Muay Thai to get to Relson’s. At the door, we checked in –find your name on the list — and get this: paid $10 to learn the world’s fastest growing martial art! Chris, Mike, sometimes Sam Mahi or Scott Devine would run the warm ups until Relson strode in. “Okay my friends, let’s take a look at this.” He started every class with a self defense technique, something I am very thankful for until this very day. Then we moved on to other techniques in the Relson Gracie textbook, concluding with the grappling sessions to which we in BJJ are so hopelessly addicted. I will continue this reminiscent journey soon, but will leave you now with these videos of a young Relson Gracie in these well known karate challenge matches. Following that, Relson tells his story of the events leading to that decisive victory.